SarahViz.com: It Was a Great 3rd Birthday Party! It Was a Great 3rd Birthday Party! 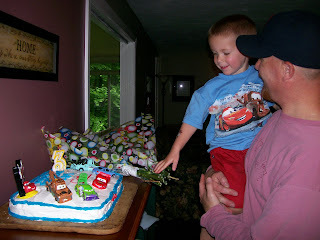 I love my Cars cake, Daddy! 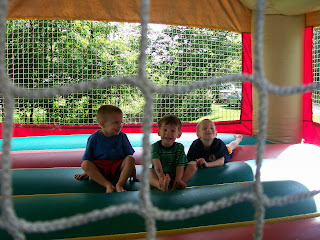 Frick, Frack and Fruck on the "jumpything". Jumpythings are so cool! Kids love them! Looks like fun! Did daddy make the cake? Wow! Looks like it was a lot of fun. Alexander's third was Car's too. :) Happy Birthday to the birthday boy! Happy Birthday! Gotta love Cars man! I love threes...did I really just type that?! I always love a successful birthday party. Looks like a fun birthday...can't wait till we can have a jumpy thing for the boys...or maybe we can just get one for us!